BASIC TECHNICAL DATA: Power rating (kW) 19 Average water power (kW) 15 Dimensions: height x width x depth (mm) 868x711x577 Flue Diameter (mm) 200 Thermal efficiency (%) 80 Emission of CO (at 13% O2) > 0,3% Temperature of combustion gasses (CO) 234 Weight (kg) 161 Capacity of water (l) 40,50 Heating surface (m2)* 150 Length of wood (mm) 500 Fuel: Wood, Turf, peat smokeless fuels. Material :The grate is made of cast iron, and the water jacket is made of 4 mm boiler steel More details to follow. Please phone or email for details. Double Sided inset / insert Tunnel Boiler Stove 19kW. Inset / insert Boiler Stove Ireland with External Air Inlet. 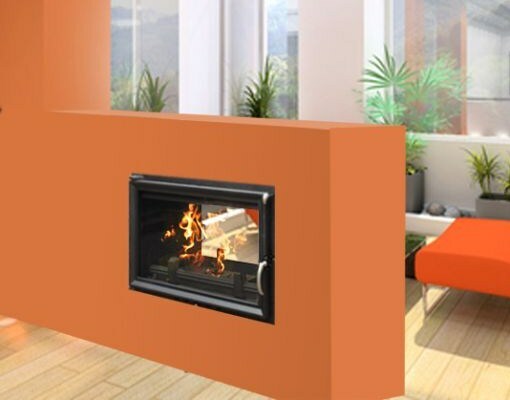 See also www.inset-stoves.com or click on WEBPAGE below.